Berlin is easy to reach via plane, train, bus and car. There are many low-cost airlines serving Berlin and therefore the travel costs to Berlin should be particularly low for participants from all over Europe. The venue is in south-western part of the city and can easily be reached by the public transportation system. Way from U-Bahnhof Dahlem-Dorf to Freie Universität Berlin (map: https://goo.gl/maps/vmkRY). 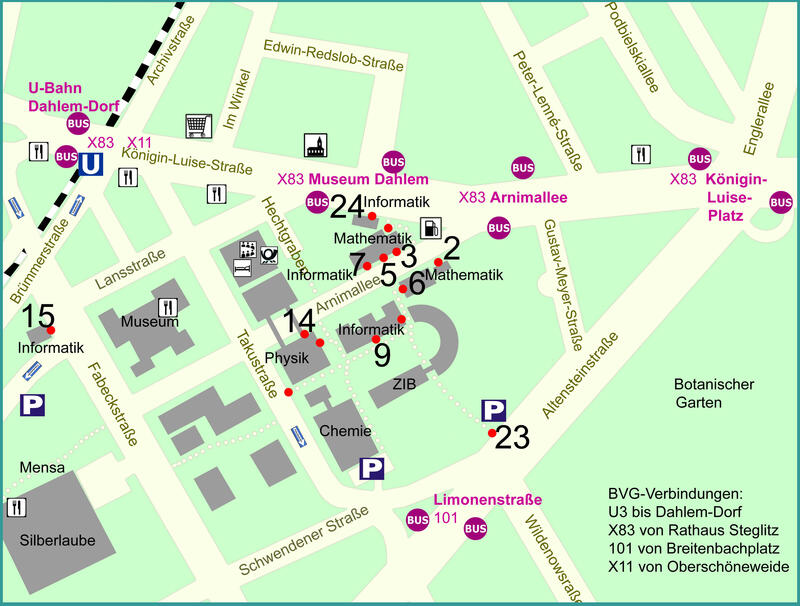 Way from S-Bahnhof Botanischer Garten to Freie Universität Berlin (map: https://goo.gl/maps/BvaLG). Take S-Bahn S7/75/5 westwards, direction Rathhaus Spandau/Potsdam Hbf. Get off after 3 stations, at Zoologischer Garten. Change into U-Bahn U9 southbound, direction Rathhaus Steglitz. Get off at the terminal stop (Rathaus Steglitz). Change into bus X83 direction Königin-Luise-Str/Clayallee. Get off after 4 stations, at Arnimallee. Take bus M85, direction S Lichterfelde Süd via Hindenburgdamm. Go to bus station Albrechtstraße. Take bus X83, direction U Dahlem-Dorf. Get off after 4 stations at S+U Zoologigischer Garten. Change into U-Bahn U9 southbound direction Rathaus Steglitz. Get off after 2 stations at Spichernstraße. Change into U-Bahn U3 southbound direction Krumme Lanke. Get off after 7 stations at U Dahlem-Dorf. Exit the underground station and follow the detailed partial Campus map (you are at the little U in the top left corner). Please note that until further progress of the new airport infrastructure, the S-Bahn station remains in 10 minutes WALKING distance from the arrival hall ... A taxi right away from the arrival hall will cost some 37 €. Take S-Bahn S45 towards Gesundbrunnen. Get off at Heidelberger Platz. Change into U-Bahn U3 southbound, direction Krumme Lanke. Airport bus (directly from arrival terminal!) Bus 171, direction U Hermannplatz, every 20 minutes. SXF1 express bus to Südkreuz (20 minutes but extra-ticket necessary), then continue with S-Bahn as above. Take bus X9 oder 109 (right at the airport building) direction Zoo. Get off at stop Jakob-Kaiser-Platz. Take U-Bahn U7 direction Rudow. Get off at U-Bhf Fehrbelliner Platz. Take U-Bahn U3 direction Krumme Lanke. Take Autobahn A115 exit "Hüttenweg" (2). Follow Hüttenweg until Clayallee (2nd lights). Follow the map that you get when you follow this link (Arnimallee 7 and then switch to "Kartengröße 5x5" and "Zoomstufen ca. M 1:20000." Finally use the above-linked detailed map of department buildings.